Sébastien Britton research focuses on deciphering and targeting DNA Double-Strand Break (DSB) repair mechanisms. A key development in Sébastien’s research was the discovery in 2013 in the Steve Jackon lab (Gurdon Institute, Cambridge) of a new method allowing for the first time to visualize by high- and super-resolution microscopy the accumulation at DSB of the proteins from the main DSB repair pathway . Then recruited in 2015 by the Pharmacology/Biotechnology section of CNRS in the team of Patrick Calsou at IPBS in Toulouse, Sébastien took advantage of this new approach to decipher the mechanisms controlling how the proper DSB repair mechanisms are chosen . These studies also demonstrated that these mechanisms are druggable and can be targeted to sensitize cancer cells to specific DNA damaging anticancer drugs [1,2]. Indeed, in addition to his basic research on the DNA damage response [3,4], Sébastien aims at discovering new small molecules with therapeutic applications. 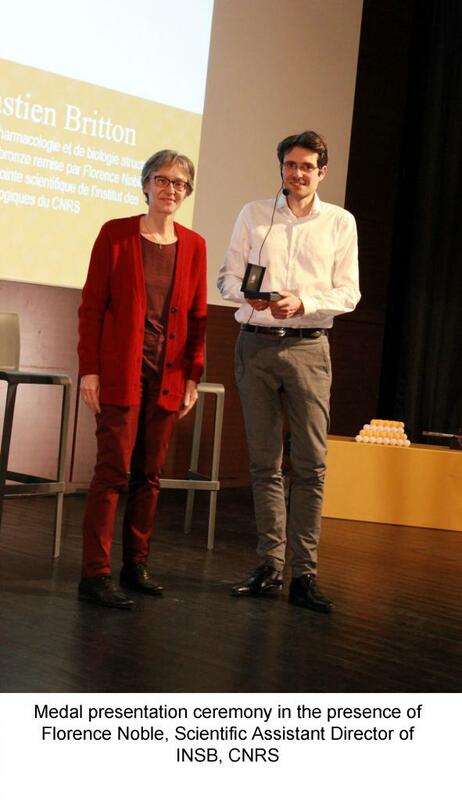 It is again in Cambridge that Sébastien contributed in 2014 to a work which was transformative for his research and led to the discovery of remodelin, a small molecule alleviating the nuclear architecture defects of laminopathic cells, and of its mode of action . This work relied on a dedicated phenotypic screen assorted to the use of clickable molecules for imaging and chemoproteomics, two approaches that Sébastien is now combining with functional genomics to discover new druggable DNA repair complexes. His project received an ANR JCJC funding in 2017, and led to the deciphering of the mechanism of action of new anticancer small molecules derived from marine sponges compounds in a multidisciplinary collaboration with labs from the LCC and SPCMIB in Toulouse (unpublished results). Britton S, Coates J, Jackson SP*. "A new method for high resolution imaging of Ku foci to decipher mechanisms of DNA double-strand break repair." Journal of Cell Biology (2013). Chanut P†, Britton S†,*, Coates J, Jackson SP*, Calsou P*. "Coordinated nuclease activities antagonize Ku at single-ended DNA double-strand breaks." Nature communications (2016). Yuan Y†, Britton S†, Delteil C, Coates J, Jackson SP, Barboule N, Frit P, Calsou P*. "Single-stranded DNA oligomers stimulate error-prone alternative repair of DNA double-strand breaks through hijacking Ku protein." Nucleic Acids Research (2015). Britton S†, Dernoncourt E†, Delteil C, Froment C, Schiltz O, Salles B, Frit P*, Calsou P*. "DNA damage triggers SAF-A and RNA biogenesis factors exclusion from chromatin coupled to R-loops removal." Nucleic Acids Research (2014). Larrieu D, Britton S, Demir M, Rodriguez R*, Jackson SP*. "Chemical inhibition of NAT10 reverses nuclear shape and other defects of laminopathic cells." Science (2014). 2018: Addgene Blue Flame Award to the Calsou’s team!